The year of 2018 was historic for the Real Estate Sector of the country as the four devils i.e. Demonetization, Real Estate (Regulation and Development) Act, Goods & Service Tax and Insolvency & Bankruptcy Code has taken a the Real Estate sector on the back foot. People who are looking to buy a property are now no more interested in under construction units due to the uncertainties revolving around these laws they rather prefer to buy a ready to move in flats because of which most of the promoters are left to rely on project finances only to complete their project. If we talk about RERA, it has brought some major reforms in the Real estate sector from rise in consolidation to change of manner of development of the projects. As we know RERA was implemented on 1st of May in 2017, and the path to grow and flourish for the real estate promoters has been changed from smooth and easy to rough and difficult. Major number of promoters have looked for consolidation, investors and lenders have withdrawn their financial assistance. The path has changed and it will not easy till the time the financers don’t get the confidence that the promoter is capable to complete the projects on time with the compliance and processes of the RERA. Previously the real estate sector was administered and developed was very vague and it has become a dreadful task for the promoters to change their strategies ad methods of operation and development of the project under the RERA norms. But even the promoters caught the hold and included RERA as the normal course of business due to which the sinking ship of real estate sector again started to revive after August’18. In the meanwhile when the sinking ship was on revival mode it was again trapped in a tsunami of liquidity crunch of NBFC’s in October’18, which further made the ship sink again. 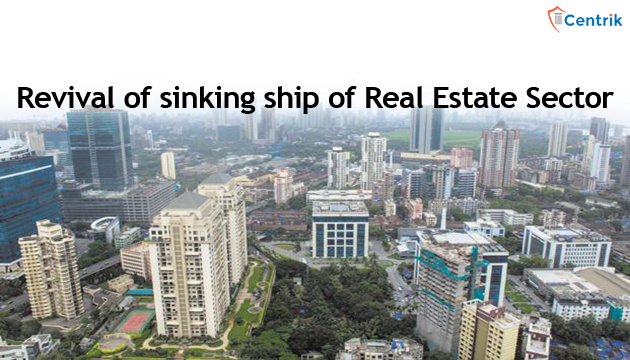 The real estate stake holders still have a common belief that sooner or later the sinking ship will again revive and float as never before, as the accountability and transparency of the projects and promoters will give them an added benefits in reviving their ships. It is also assumed that the government will implement the single window clearance mechanism for issuing the development permissions and approvals. To revive the ship the major equipment which is required will be RERA as it will soon accelerate its healing on the damage caused to the real estate sector and accelerate its performance to achieve the success similar to its peers in other sectors. It is also hoped that the way Authorities like SEBI, CCI, IRDAI and TRAI have succeeded and regulated their respective sectors, RERA will also follow the same path and help in revival of the sector on which our economy is dependent the most.